Want to start a blog? You should! It’s hard to believe I started Carolina Charm more than 7 years ago. What started as a hobby has turned into one of the best things that has ever happened to me. Over the years I have experienced so much joy in writing my heart out day after day, building a community of friends and bloggers, sharing our journey of ups and downs, collaborating with companies and more. I often receive emails from readers inquiring about how to start a blog, so today I am sharing 10 beginner’s tips. 1. Decide on your blog topic. What inspired you to start a blog? What do you love to talk about? Fashion? Cooking? Mommyhood? Fitness? It is so much easier and you will sound most authentic when you write about your passion. You will also attract readership when you are enthusiastic about what you’re sharing with the world! I originally created Carolina Charm after moving to North Carolina, falling in love with Matt, planning our wedding and cheering him on to start his own business. I felt like I had so much to share with my friends and family back home in Florida and plenty of free time to do it, so I started writing my blog as a diary of sorts. Never in a million years did I think anyone outside of my mom and best friends would read it. And that was totally fine! To this day, my focus remains the same – to share our life (the good, the bad and the ugly). The pages are filled with our daily routines and weekend recaps, the moments that make my mama heart spill over, favorite recipes and products, our vacations, our holiday traditions – and so much more! 2. Choose a platform to set up your blog. Even though I was super intimidated and nervous, I recently switched from Blogger to WordPress! I used Blogger for 7 years and loved it. With Blogger you can use your domain name, it’s easy to customize and is hosted on Google’s servers for free! However, if you’re looking to take your blog to the next level with more advanced features, maximize SEO, access to endless plugins options and customization, WordPress is a great option! If you decide to go with WordPress, you need a host, which means you will pay a monthly hosting fee. There are tons of free template options available. Or you can purchase an inexpensive template ($15-20) from Etsy. Or you can hire a designer to create a customized template to get started. Whatever you decide, make sure it is user friendly, visually appealing and your page is easy to navigate. Is your search bar easily accessible? Are your fonts easy to read? Are your posts categorized in a way readers can easily find them? Think about what you like and dislike about the blogs you follow when designing your layout. 4. Pick a blog name. Be careful not to choose a name you may outgrow (ex: newlywed, pregnancy, baby, etc.). I can’t tell you how many blogs I’ve followed that have changed their names over the years. And changing your name and domain is a pain. So, I recommend going with a blog name that is timeless and doesn’t box you in to one topic, otherwise you will limit your opportunities for future growth and confuse your readers. Also, make sure it’s a name you are proud to share out loud. Once you’ve selected a name, match your social media handles so you are easy to find and purchase a domain name. I purchased my domain name from Go Daddy for a few dollars a few years after I started blogging and have learned there is SEO (search engine optimization) value to having a .com website address. 5. Don’t start a blog with the expectation to make money. If your main goal is to make your blog a source of income, you’ll burn out quickly. I know it looks easy and there are definitely perks of receiving free things or getting paid to review a product or service, however, making money blogging is no easy feat – it takes a lot of grit, hard work and time to build your readership and secure collaborations. As you grow, there are a few ways to monetize your blog – securing collaborations with companies, adding sidebar and/or pop up ads to your blog or using affiliate links are the most common. Affiliate links generate commissions based off of clicks or sales, depending on the program. I dedicate a lot of time to blogging and love sharing products that I use and stand behind, so I really appreciate it when my readers support me by purchasing through my links. Lastly, securing collaborations with companies through sponsored posts (reviewing a product or service) is one of the best ways to create a side hustle. I struggle with these because while they can pay well, they are a ton of work. There have been many nights I have stayed up late trying to meet a post deadline, rushed home after work to squeeze in my photography during daylight hours (or use the weekends), then you have to ensure you’ve met all the guidelines, edit your pictures, and proofread your post one million times before going live on the blog and/or social media. This is why I only accept a small fraction of the collaborations I am presented with and they must be products or services that I truly would recommend and know my readers would love. 6. Take high quality photos. You don’t have to invest in a big fancy camera – iPhone photos totally work so long as you use lots of natural light, clean your lens (!!!) and learn a few editing techniques. 7. Create an About Me page. Share a little bit about yourself as well as your contact information so readers can connect with you. 8. Engage with other bloggers. Comment on the blogs you read. Participate in link-ups. Join Facebook groups for bloggers. Connect with your favorite bloggers on social media. See if there are any local bloggers who want to meet up. One of my very best friends started as a blog friend! If you really want to stand out, be YOU, and you will naturally attract a genuine audience that will come back regularly, leave thoughtful comments and want to engage with you! Get a little personal and vulnerable – it makes you relatable! My greatest compliment is when readers email me or approach me in the grocery store and say they feel like they know me in real life. I love that so much because I do try to share raw snippets of life and write my blog as if I’m chatting with a friend. I make plenty of spelling errors, grammar mistakes and overuse exclamation points, but again, that’s real life for me. It’s not about the numbers, I promise! Don’t compare yourself to other bloggers – everyone is unique and in different stages with their blog. Just keep writing. As long as you love it. Love this! I have followed your blog for a while now and love how authentic you are! I could not agree with these more! I switched to WordPress a couple of years ago and I’m so happy with it. Also agree about the money thing – it takes time! And meeting/connecting with other bloggers is a huge part of the fun! I’ve been following you for years and love how authentic and down to earth you are! Keep it up, mama! I love your blog, and have been following you for years! ❤️ So relatable and great content. I feel like we’d be friends in real life. Yay! happy almost 3 year blogiversary! Your blog is adorable! You encouraged me to FINALLY start my blog today! My husband and I are building our first home, and I’ve been wanted to document it as well as our life in the process. This post gave me just the push I needed! My name is Nikki and my blog is islandgirlmakes.blogspot.com I’d love to have y’all check it out! YESSSSSS! Welcome to blog land! This is the perfect time to start a blog! You’ll love having your home build process documented to look back on! Yay! I’m still learning wordpress but am really like it!!! I am just starting a blog after sitting on a domain for years and writing ghost posts but never making it public. I have followed for years, feel like I know you and have been so inspired by your example. This post is incredibly well timed for me. thanks! I love this!! Thank you so much!!! Love your blog, have been reading for years and it is one of my favorites! I just started my blog at the end of last year and am working on growing it! Yay! Congrats and welcome to blog land! Love your fashion picks! Thanks for sharing this great advice. I’ve been blogging for less than a year, but I love it. The only problem so far is that I have the technology skills of a senior citizen, so figuring out the blogging process has been a struggle. HAHA. I still struggle with all the technology and am ALWAYS asking my blog friends questions!!! I love, love, love your blog! Always one of my favorites!! Such great advice! I absolutely love reading your blogs and getting a glimpse in to your every day family life. Love this post! 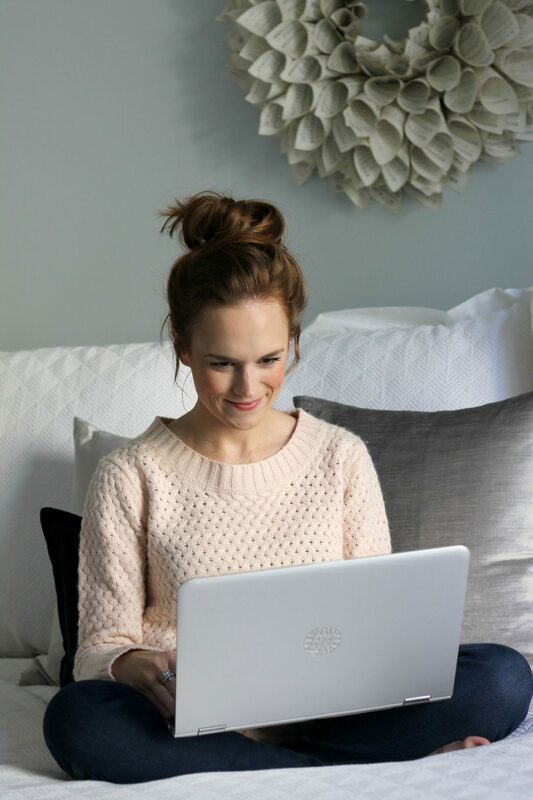 Your blog is always one of my favorites to keep up with! Thank you sooooooo much, Amanda! You’re the best! Hey Christina! I started my blog less than a year ago and it has really pushed me to do things that I wouldn’t have done before, such as moving and working remotely for a few months this summer. I can’t wait to share this journey and more. I love reading your blog every morning – thanks for the time and effort you put forth to make it so down-to-earth! Oh my gosh, Pip! I LOVE that you are doing a remote stint in Richmond! How cool is that!? And you can document it alllllll!!! Thanks – I am BEYOND excited and literally counting down the days! It’s amazing how this blog has pushed me out of my comfort zone already! Thanks! I’m BEYOND excited and counting down the days! It’s amazing how this blog has pushed me out of my comfort zone already. Great advice! I feel like I have been blogging for ages. And I feel like I’ve been following your blog for ages!!! You’re one of my favs – I’ve been following since before Caroline! 🙂 Thanks for sharing! AH! Thank you so much for reading along all this time!!! I have been reading your blog for years! I recently started blogging again! I love it, and hate that I let it go by the wayside for too long. YAY! Welcome back! Your boys are ADORABLE! Cutest little fam!! Absolutely love these tips and ideas, thanks for sharing! I started following you way back when. Back then, I started a blog but it didn’t inspire me so I picked back up with a new one, The Lucky Lifestyle, in July and am coming up on my one-year blogiversary! 😉 It’s such a great creative outlet for me and a way to meet and connect with fantastic new people. Anyway – thanks for a great post! YAY! Happy almost blogiversary, Jen!!! That is so exciting! Long time reader, first time posting! Love this list and it was so helpful as I just started my own blog! Thanks for the tips! I love this so much! All such great tips! I chose a blog title that I have already outgrown wahhhh worse mistake ever! I have been thinking about changing it for months but I dread it!